Star Wars has no shortage of merchandise tie-ins. From Band-Aids to bed sheets, there is nowhere in a store you can go without finding something attached to the multi-gazillion dollar franchise. Food is no exception and has some of the most shameless cash grabs in the galaxy. Can the same be said for The Star Wars Cookbook series? Easy, kid-friendly recipes with plenty of Star Wars puns for the moms and dads, this cookbook series has been tying the Force to the kitchen since 1998 with Wookies Cookies, Darth Malts, Wookie Pies, and other galactic recipes. 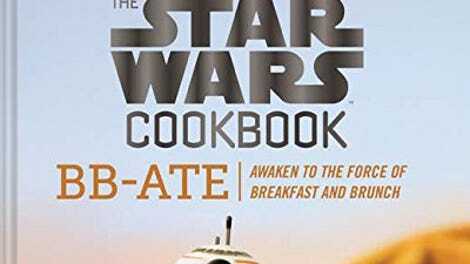 The most recent book in the series, BB-ATE: Awaken to the Force of Breakfast and Brunch is the first since Disney bought out Lucasfilm and released the new Star Wars saga and spin-off films. Like its predecessors, BB-ATE reaches far, sometimes really far, to relate the recipe to the film, and it pairs many of the recipes with scenes featuring the intended dish and the Hasbro action figures. As the biggest and most-fervent Star Wars nerd in our office, I was tasked to find out how accurate these tie-ins and photos were to the films, and to see if the author Lara Starr (with photographer Matthew Carden) did their homework and made sure that this cookbook, intended for children, could hold up to the scrutiny of an adult uber-fan. Some of the moments, much like the movies, felt cringe-worthy. It’s hard to get behind “Kylo’s Ren-Egade Fruit Bowls and Phasmatic Potato Packets” and their desperate attempts to convince young cooks that these recipes are just like a scene out of the movie. The subheader to the Phasmatic Potato Packets literally says “Captain phasma has shiny metal armor. These savory breakfast potatoes are cooked in shiny aluminum foil pouches.” Oh! I get it! 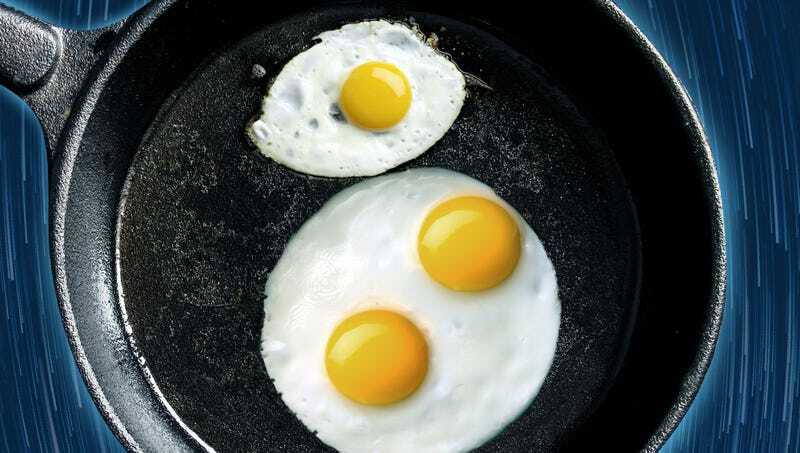 A recipe as disappointing as the character! Then as my 34-year-old head is shaking in disgust, I come across recipes like “Luggabeast Of A Quiche” and “Kanjiklub Sandwiches”—now here were solid recipes to teach the kids and for adults to have in their pockets, as well as a deep grab at Star Wars obscurity. The Luggabeast was a Dewback-type creature on Jakku in The Force Awakens, ridden by a selfish scavenger, Teedo, who had BB-8 trapped in a net destined for sale to Unkar Plutt before the droid was saved by Rey. This creature was on screen for about 10 seconds, never had an action figure (seriously a huge surprise there since they make action figures of everything), and the only way anyone knew it was called a Luggabeast was from its Lego set. Same goes for Kanjiklub, the gang played by the cast of The Raid in The Force Awakens, who show up to get their investment back from Han Solo after he failed to deliver, once again, on a deal. They did get an action figure set, but children don’t care about Kanjiklub (you can tell that to Kanjiklub). If they take away anything from that sequence, it would be the rolling meatballs-with-teeth Rathtars, which if this book wasn’t centered around brunch, would’ve been a great recipe. The photography, fortunately, held the same attention to detail throughout the book. Being a Star Wars collector, I appreciated the use of the action figure and the scenes the photographer managed to create using Starr’s food. Accompanying the “Luke Skywaffles” recipe was Luke, wrapped in a homemade robe standing at top a stack of fresh waffles, being offered his long lost lightsaber from Rey. An amateur would’ve just had the Rey figure featuring her costume from Jakku which the audience sees her in for almost the entire movie, but not in this book. Thanks to Hasbro’s relentless barrage of action figure variants, Rey is seen in this photo wearing her Ahch-To outfit which features a short jacket. I also double-checked the accuracy of another photo featured with Maz Kanata Frittata where Han, Maz, Rey and Finn are seated at a table made out of a slice of frittata, mimicking the scene from Max’s castle bar on Takodana. Sure enough, they are seated in the right order. There was, however, something about this book that became slightly distracting. Since this was released in 2017 to tie-in to The Last Jedi, the book centered mostly around The Force Awakens. I can’t figure out if it’s because food references to The Last Jedi are harder to make, or they were only able to find the Rose action figure on Force Friday and didn’t have anything else to work with, but the recipes were random and scarce. (Also, it could be that producing a book is often a year-long process). Seeing how some of the other references were a deep pull, the references to the The Last Jedi were general and vague, much like the descriptions on the back of the action figure packaging. The sub-description for “Rose’s Galaxy Granola Bars” is “Rose is a mechanic for the Resistance. Refuel with these granola bars.” The Last Jedi should’ve been saved for the inevitable next book. Overall, I have to say that this book covers a lot of bases and uses Star Wars to its advantage beyond just a marketing ploy. Kids will appreciate the photos and get excited accomplishing these easy recipes. Grown-ups will appreciate the ridiculous puns attached to the many fun references.